David Cox comes up with a sharp way to simulate the locker problem. Want an easy way to build buy in? Have kids make predictions on something and make sure it takes a long time for them to see if they’re right. Like I said, our delay was a couple hours and this pretty much took up the entire time. And one has … the dreaded Disease Z. Students must identify who has The Dreaded Disease Z, as it is highly contagious – and fatal! If the infected person boards the ship with everyone else, they are all doomed. The only way to identify each person’s health is through blood testing; a bag for each person has representative chips for their blood levels (per chart included below). I used color tiles in brown paper bags for this, and let students take 40 “blood samples.” With 40 chances, students had to be strategic about which bags to sample from. Marshall Thompson uses math to corral his toddler. What if I cut it into two 2 ft x 8 ft pieces and zip-tied them together? I’ll bend them into a circle with a 16 foot circumference. How much bigger or smaller than the play yard would it be? Would I need another sheet to make it big enough? But where I’m flummoxed is how we are supposed to provide practicing educators with the tools to evaluate these kinds of findings. I know you can’t sell a curriculum product or a newsletter with headlines like “HUGE STUDY PARTIALLY VALIDATES ALGEBRA PROGRAM, PARTIALLY DOESN’T.” I don’t expect Carnegie Learning to build a web site that says “Major study shows no significant impact of Cognitive Tutor in middle schools!” But it also isn’t clear to me who in the system is incentivized to provide disinterested, broadly-accessible, readable summaries of important studies that help educators make careful decisions with scarce resources based on careful interpretation of existing evidence. Despite the risk of bearing the responsibility for the Standards total estimated cost of $258,000 former Executive Director James Gates claimed “the proposal [to fund the Standards] was not submitted to either NSF or the U.S. Department of Education, so that no claims could be made that the federal government had funded the development of curriculum and evaluation standards.” In addition, the self-funding of the Standards and the decision to not write textbooks, as had been the case during the new math era, afforded the working groups relative independence from textbook publishers. 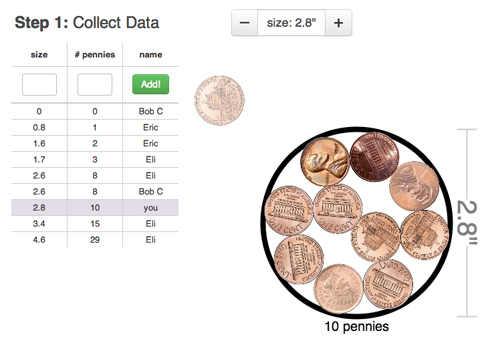 TLDR: Check out Penny Circle, a digital lesson I commissioned from Desmos based on material I had previously developed. Definitely check out the teacher dashboard, which I think is something special. This is it, the last entry in our summer series of #MakeoverMonday. Thanks for pitching in, everybody. Lower the literacy demand of the task. The authors rattle off hundreds of words to describe a visual modeling task. Clarify the point of the task. A great way to lower the literacy demand is to convey the point of the task quickly, concisely, informally, and visually, and then formalize, expand, and verbalize that point as students make sense of it. Here, the point isn’t all that clear and the central question (“How can you fit a quadratic function to a set of data?”) is anything but informal. Add intellectual need. The task poses modeling as its own end rather than a means to an end. Models are useful tools for lots of reasons. Their algebraic form sometimes tells us interesting things about what we’re modeling (like when we learn the average speed of a commercial aircraft in Air Travel by modeling timetable data). Models also let us predict data we can’t (or don’t want to) collect. We need to target one of those reasons. The most concrete, intellectually needy question, the one we’re going to pin the entire task on, pops its head up 80% of the way down the page, in question #2, and even then it needs our help. Lower the floor on the task. We’re going to delay a lot of these abstractions – tables, graphs, and formulas – until after students know the point of the task. We’re going to add intuition also and ask for some guesses. Motivate the different abstractions. The task bounces the student from a table to a graph to a power function in five steps without a word at any point to describe why one abstraction is more useful than another. Students need to understand those differences. A table is great because it lets us forget about the physical pennies. A graph is great because it shows us the shape of the model. And the algebraic function is great because it lets us compute. If those advantages aren’t clear to students then they’re only moving between abstractions because grownups told them to. Show the answer. We tell students that math models their world. We should prove it. The textbook does great work here, asking students in question #2 to “check your prediction by drawing a circle with a diameter of 6 inches and filling it with pennies.” Good move. But students have already drawn and filled circles with 1, 2, 3, 4, and 5-inch diameters. I’m guessing they would rather draw and fill a 6-inch circle than do all that math. 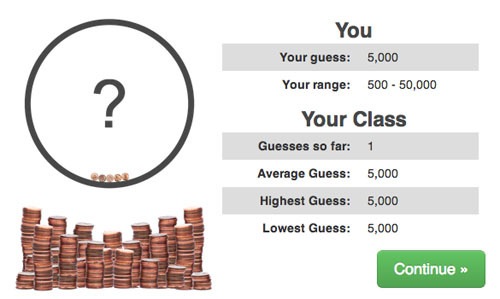 The circles need to get huge to make the mathematics worth their while. We’ll ask students to commit to a guess. We’ll ask for a number they know is too high, and too low, asking them early on to establish boundaries on a “reasonable” answer. The digital, networked platform here lets us quickly aggregate everybody’s guesses, pulling out the highs, lows, and the average. Then we’ll talk about the process of modeling, of looking at little instances of a pattern to predict a larger instance. We’ll have them gather those little instances on their computers, drawing circles and filling them. Those instances will be collected in a table which will then be aggregated across the entire class creating, a large, very useful set of data. 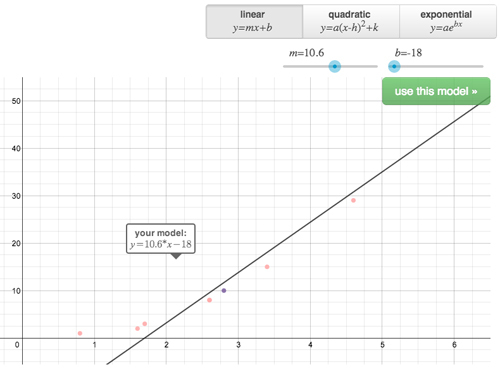 Next we’ll give students a chance to choose a model for the data, whereas the textbook task explicitly tells you to use a quadratic. 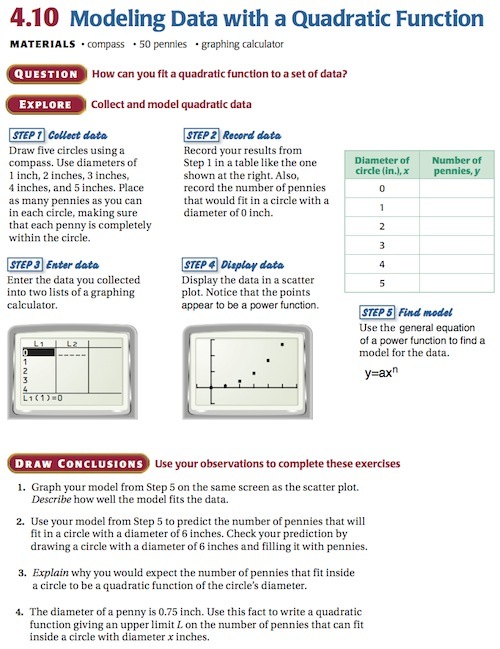 (Selecting between linear, quadratic, and exponential models is work the CCSS specifically asks students to do.) So we’ll let students see that linears are kind of worthless. Sure a lot of students will choose a quadratic because we’re in the quadratics chapter, but something pretty fun happened when we piloted this task with a Bay Area math department: the entire department chose an exponential model. Eric Berger, the CTO at Desmos, suspected that people decide between these models by asking themselves a series of yes-or-no questions. Are the data in a straight line? If yes, then choose a linear model. If not, do they curve up on one side of the graph (choose an exponential) or both sides of the graph (choose a quadratic)? That decision tree makes a lot of sense. But the domain here is only positive circle diameters so we don’t see the graph curve on both sides. All this is to say, if you’re a little less helpful here, if you don’t gift-wrap answers like it’s math Christmas, students will show off some very interesting mathematical ideas for you to work with. 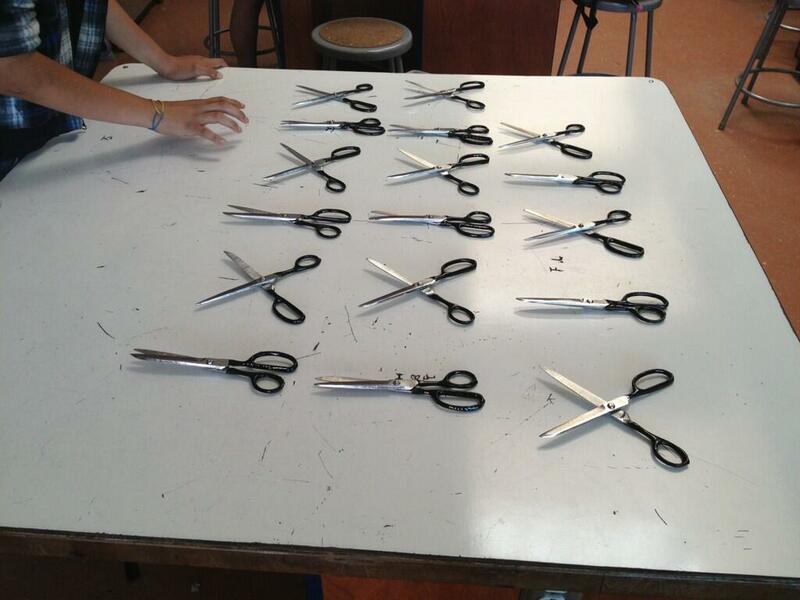 Once a student has selected a model, we’ll show her its implications. The exponential model will tell you the big circle holds millions of pennies. We’ll remind the student this is outside her own definition of “reasonable.” She can change or finish. We’ll show the answer and ask some follow-up questions. Change the context. It’s a totally fair point that packing pennies in a circle is a fairly pointless activity, one with no real vocational value. When I pose this task to teachers as an opportunity for task revision, they’ll often suggest changing the context from pennies and circles to a) pepperoni slices and pizza dough or b) cupcakes and circular platters or c) Oreos and circular plates, basically running a find-and-replace on the task, swapping one context for another. I don’t think that does nothing but I don’t think it does a lot either. It’s adding a coat of varnish to a rotting shed. You’re still left with all the other issues I called out above. We’ll talk about the teacher dashboard next. Andrew Shauver wants students to work with the physical pennies. Megan Schmidt focuses on all the different ways the directions of the task think for the students. Jonathan Claydon makes over a different modeling task with a bunch of nice ideas and I push back in the comments. Good material in the preview post. Our final #MakeoverMonday task this summer is also the most tragic, where tragedy is measured in wasted potential. There’s lots to love here. Lots to chew on. Lots to improve on. If you’ve tuned into this series this summer, you can probably anticipate 90% of “What I Did.” What would you do?